I love squid so much but never prepare and clean one all by myself. It took me a long time to clean it but it was really fun and I learned something new. This squid was so big (3 pounds) I made it into 2 dishes, most of it turned into spicy calamari, taste great serving it hot but even better chilled it in the fridge overnight as a cold appetizer. I love it hot. I love it more when they are cold. Warning: this is really really spicy, adjust the chili sauce amount to your taste. 1. Heat wok over medium high heat until smoking hot, add chili garlic sauce, soy sauce and green onion and stir well. Add sugar if want to balance the spicy favor a little. 2. Toss squid into spicy sauce, cook until it started to shrink. Heat off immediately and serve. Do not overcook, it will turn rubbery and hard to chew. 1. Spicy calamari can be served hot or cold. Adjust chili sauce amount according to your taste. 2. If you like the extra spicy favor, serve it hot right off the wok. 3. Serving it cold as an appetizer? Cook it a day ahead and chill it in the fridge, favor developed overnight and taste even better. 4. I recommend the Vietnam Chili Garlic Sauce with a Rooster in the front of the bottle, made by Huy Fong Food Inc. 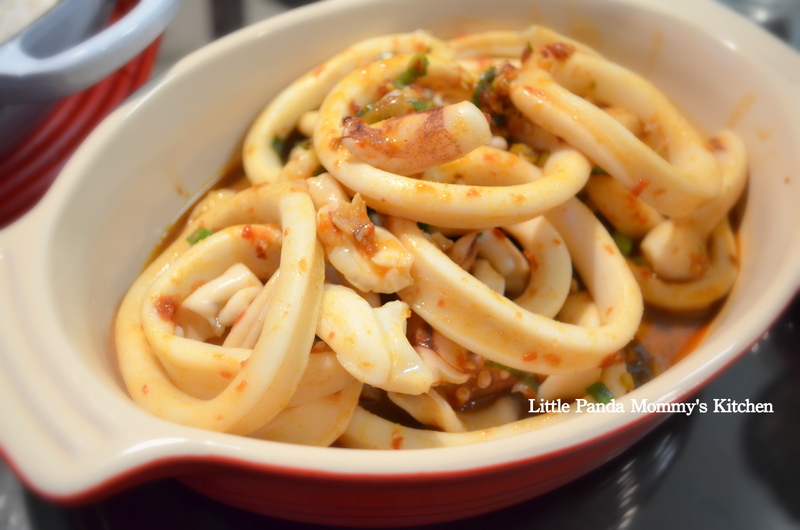 This entry was posted in Appetizer, Cast Iron Recipe, cook in 15 minutes 15分鐘開餐, Easy Cooking, Lodge Recipes and tagged recipe, squid recipe. Bookmark the permalink.